More than 100 people attended UM’s New Leadership Open House in the Shalala Student Center on Oct. 26 to greet seven of UM’s new administrative leaders: Jeffrey Duerk, executive vice president and provost; Jacqueline Travisano, executive vice president for business and finance and chief operating officer; Dr. Edward Abraham, dean and chief academic officer of the Miller School of Medicine, acting executive vice president for health affairs and CEO of UHealth; John Quelch, dean of the School of Business Administration and vice provost for executive education; Cindy Munro, dean of the School of Nursing and Health Studies; Lourdes Dieck-Assad, vice president of Hemispheric and Global Affairs; and Ryan Holmes, associate vice president for Student Affairs and dean of students. 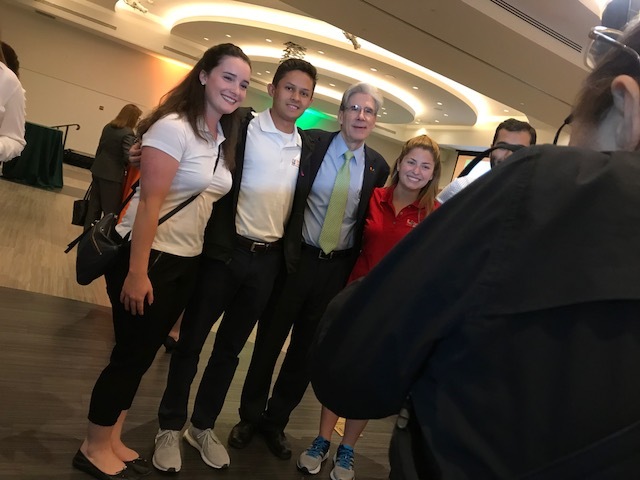 President Julio Frenk spoke about Moving the U Forward, an initiative to make UM “a magnet for talent,” before bringing each of the new leaders up to the stage. After they were introduced, the new leaders were assigned to their own Q&A stations, where they were available to greet guests. 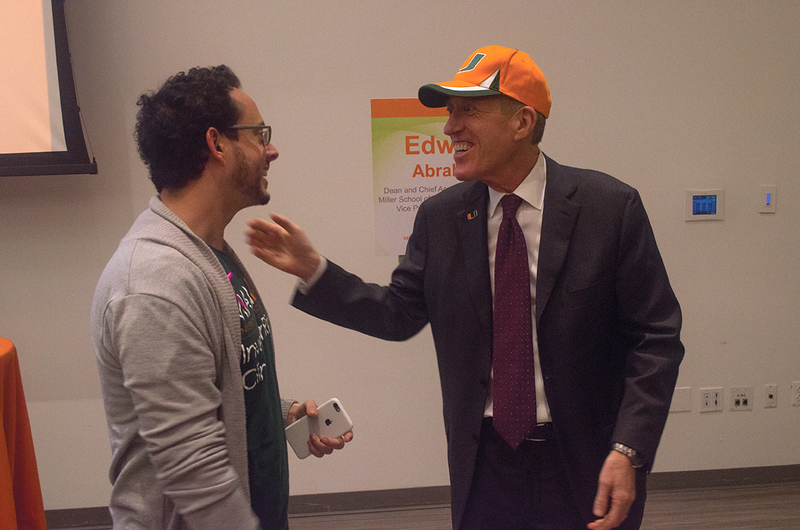 Frenk also invited new student leaders, including Student Government President Adrian Nuñez, Student Trustee and Student Bar Association President Alessandria San Roman and Graduate Student Association President Chris O’Toole. Administrators, students and members of the UM community mingled while enjoying refreshments and ice cream from Hip Pops, and slideshows displayed fun facts about each of the new leaders – Abraham used to ride calves in rodeos, Munro trained to be a mermaid at Weeki Wachee springs and SG President Nuñez can recite Hamilton lyrics by heart. Senior Rachel Russel, chair of Student Government’s Category 5 programming board, said she came to the event to show support. Members of the greater Coral Gables community also attended the event. Fourteen-year-old Grace Rodriguez has been taking private piano lessons at the Frost School of Music for over a decade and attended the meet and greet with her father, Osvaldo Rodriguez, an aerospace engineer. The two had previously met Holmes, a talented vocalist, through a music class. Osvaldo Rodriguez, who said he previously worked for NASA, was impressed by Frenk’s work so far on attracting talent.